As the name suggest, Belfast Castle can be found in Northern Ireland in Ulster Province's Antrim County. 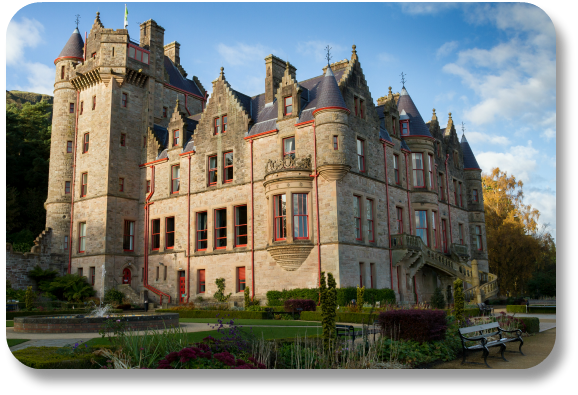 Although Belfast Castle is part of Northern Ireland, it is less than two hours from Dublin Airport by car. You'll head north on the A1 for about an hour, and then you'll cross the national border into Northern Ireland, following the M1 for about 45 minutes before turning onto Lansdowne Road right to the castle's parking lot. Arguably one of the best-known castles in Ireland is Belfast Castle, built by the Normans in the late 12th century. The castle is an iconic symbol of the city of Belfast and of County Antrim, and it is referenced in local art, pop culture and song. Today, the castle is often used for events and weddings, but visitors can also stop by for a meal at the onsite restaurant, tour the visitor's center and pick up some unique souvenirs from the antiques shop located right inside the castle. Belfast Castle is located on the slopes of Cave Hill Country Park. Cave Hill is a natural landmark in Belfast that boasts five caves. If you're visiting the castle, you'll also want to explore Cave Hill. Natural rock formations like Napoleon's Nose and the White Stone are archeological monuments of historic significance. The Castle dates back to the 12th century. Originally, it was located right in the heart of downtown Belfast, overlooking what is now the high street. In 1708, the original Castle burned down. When it was rebuilt, construction began in the new location at Cave Hill. The current version was built between 1811 and 1870. Construction was overseen by the owner and resident during that time, the 3rd Marquess of Donegall. By the early 20th century, financial ruin meant that the Donegall family needed to sell the house. The new owner, the 9th Earl of Shaftesbury, gifted the castle to the City of Belfast in 1934. Major refurbishment of the castle took place in the late 1970s. The Belfast City Council took major pains to ensure that the castle was historically accurate and safe for millions of visitors. If you want to upgrade your visit, you can dine at the onsite restaurant. The Cellar Restaurant is open daily, but it is best known for its marvelous Sunday roast lunches. While you're in the area, you might also want to check out the Belfast Zoo. The zoo is located within the Cave Hill Country Park, putting it just next to the castle. Visitors should start in the basement, where there is plenty of information about the castle. Then, head upstairs to explore the rest of the property, including the gardens, on a self-guided tour. You can find more information at the official website here.